This article was written by guest author Graham Gerhart. It may be assumed that having a four-bid region assures the safety of higher seeds maintaining their position to go to Nationals. But in a region as deep and volatile as the Southwest, there’s always room for surprises. After two days of intense play and close calls, #2 Stanford, #8 UCLA, #7 California, and #24 UC San Diego emerged from the crowded field and advanced to Cincinnati. Competing in a straight 16-team bracket to determine the regional champion, the first round on Saturday saw very little in the way of drama — only Cal Poly SLOmotion knocking off San Diego State in the 8-9 matchup registered as an “upset” while the rest of the games saw the higher seed run away from their opponents. In the second round however, we got our first real surprise of the weekend. The #16 Southern California Hellions of Troy enjoy playing scrappy ultimate and often don’t mind trading points, confident that they will eventually outwork their opponent and earn some breaks. After going down to #23 UC Davis, USC relentlessly pursued the the break they had lost, but credit to the Rogue offense for their composure and discipline. In the end, they did enough to hold on for the win and advanced with the tournament’s first unpredictable upset, 9-7. Elsewhere in the front-door quarterfinals, the California Pie Queens used their athleticism and unyielding pace to run past UC Santa Barbara into the semis. 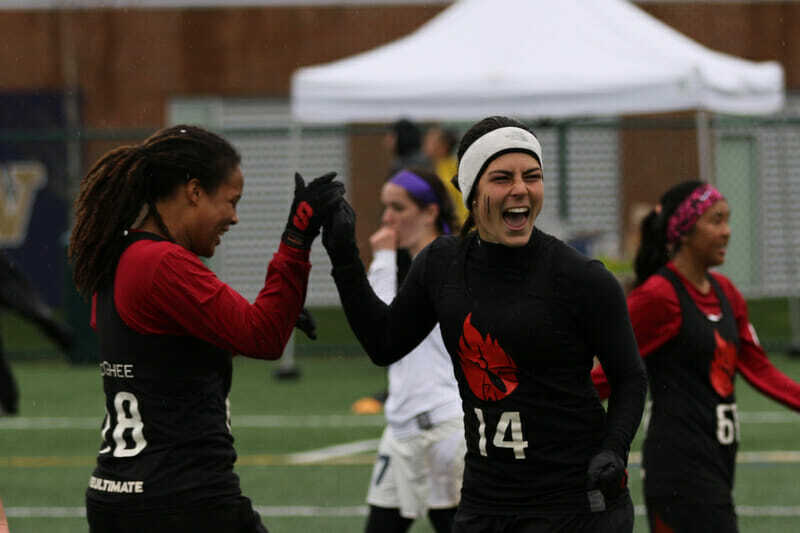 California plays at a speed other teams frequently cannot match; the Pie Queens are unafraid to make risky throws and the risks paid off immensely on Saturday. On the other side of the bracket, the region’s No. 1 seed, Stanford Superfly, dismantled the Cal Poly defense to advance comfortably with a 15–3 win. Stanford’s discipline and patience with the disc opened multiple opportunities downfield, and Cal Poly looked tired after their tough game with SDSU in the previous round. UCLA BLU also created their own opportunities against UC San Diego Psycho in their quarterfinal with strong swing passes and breaks through tight windows. UCSD plays best when their lofty hucks are plucked from the sky by their tall receivers, but UCLA proved up to the challenge of defending those deep shots and UCSD struggled to convert any other way. In the first semifinal, a clearly tired UC Davis team simply did not have an answer to the pace set by the California women. The Pie Queens continued to march to the same beat that they had all day, using their high energy and athletic plays to put the Rogue defense on the back foot from the outset. Davis’ skilled throwers could not find open targets downfield, resulting in many forced turns. By the time Rogue found their rhythm, it was too late — California’s lead proved to be insurmountable. In the other semifinal, UCLA and Stanford both dug deep into their mental and physical reserves in hopes of finding an edge over the other. The two had yet to play in the 2017 season, but they know each other well; Stanford was clearly prepared, sporting a zone crafted specifically to prevent Han Chen from getting the disc (with good reason). UCLA, however, proved that they were more than a one woman team — big plays from a number of other players up and down their roster kept them in contention. Stanford eventually pulled ahead, but their four-point margin in the 9-5 victory does not reflect how hard fought the game was throughout. With Stanford leading 3-2, the sixth point lasted nearly five minutes with multiple turns and huge bids from both sides. The game could have swung either way during that point, but Stanford converted and went up by two breaks, a deficit from which UCLA never managed to recover. Saturday ended with most teams falling in the placement brackets according to seed — apart from USC, who had a long journey to get back into contention. A first-round matchup with UCLA in the second place quarterfinals would set them up for a very tough Sunday indeed. Day two in Roseville revealed five teams who were seriously battling for only four bids. A slew of excellent games between these teams on the second day once again proved the parity and depth in the Southwest region. But, in the end, Stanford stood above them all, again. The regional championship game was as competitive as one could hope for, but Stanford proved their pedigree, taking down the Cal Pie Queens 13-9. California and Stanford had both dominated their competition to reach the final, and both teams looked sharp to start off Sunday. Monisha White remarked that Superfly believed themselves to be the clear top team heading into the tournament and that they set out to prove it this weekend. The statement was made loudly in Sunday’s title game. While there were times in the first few point when Stanford seemed flustered, it was predominantly due to their attempt to match the pace set by California, who moved the disc at a blistering rate. Once Stanford slowed down and played their own crisp, calm, and elite offense, it translated into consistent points. California, for all their dominance throughout day one, could not maintain their pace against a defense as disciplined as Stanford and made a few errors that Stanford did not waste. Accuracy was the key to Stanford’s victory: in a gusty wind, Stanford’s throws hit their receiver directly while some of the Pie Queens’ throws were hard to catch, whether through simply execution errors or blades that did not fare well in the conditions. California’s D-line was every bit as athletic and excitable as their offense, but Stanford refused to be intimidated. Stanford impressed the most with strong ultimate IQ across the team. They exhibited an innate sense to keep their defenders on their outside shoulder, denying the opportunity for layout bids. Stanford also did a remarkable job of preventing Cal from using the full width of the field. Cal’s offense is at its best when it can throw wide upfield passes to streaking receivers. Stanford denied them these options and forced them to throw the disc through tight margins, often clogging just enough to lead to a turn. Small details like this helped Stanford take a lead into half. This discipline and attention to details comes from the competency of Robin Knowler Davis, Superfly’s coach of 16 years who is keenly aware of her team’s abilities. Stanford finished the final strong, beating California 13-9. This marks nearly two decades of Stanford earning a spot at Nationals. This time, it only took them four games to get there. Cal’s Coach Manisha Daryani said the Pie Queens were not discouraged by the loss to Stanford and that they treasured the opportunity to test themselves against one of the best programs in the country before Nationals. This sentiment was echoed after their game against UCLA, which they lost on double game point, 10-9. California had an impressive weekend despite their losses on Sunday. They held Stanford to a tightly contested game, and Daryani noted that she believed it was the cleanest game that Stanford had ever played. In Daryani’s eyes, California did what they set out to do and gave a fantastic contest: “If you force your opponents to play their best game, you’ve done something correctly,” she said. During the second place game, California ran fluid lines and tested themselves with a variety of matchups to prepare for Nationals. Both teams were aware they had already earned bids, and they used the game to refine their play. California was at their best when their cutters opened the field for wide margins where Anna Wysen and her handler core could notch passes upfield to open receivers. Knowler Davis commented specifically that Stanford made an effort to cycle new defenders onto Wysen in order to disrupt her rhythm. The Pie Queens’ offense is unafraid to take the first option they see for the highest reward possible. Once they gain momentum, it can be draining for defenses to recover enough to prevent California’s cutters from exploiting the deep space. The Pie Queens know the advantages that they have and use their height, speed, and athleticism to set the tempo in every game they play. After a tough loss against USC in Conferences, UCLA BLU played with incredible vigor and precision against USC on Sunday in the second place bracket, giving the Hellions few chances to break. The game was still close, but UCLA played a much tidier and more concise game that USC simply could not get past. BLU advanced, 10-8. When they faced UCSD in the second place semifinal, the BLU offense set the tone early, and UCSD could not pull off the breaks necessary to deny UCLA their position in the second place final. In that game, BLU bullied through the break side and their hucks connected with receivers often, a rare feat against Cal’s defensive unit. Han Chen is the most threatening player on the West Coast, and there was not a defender in Roseville that could disrupt her flow. Most teams had to rely on steady downfield defense to deny Chen options in hopes of it leading to a turn. Despite Chen’s impressive stature, UCLA is also simply a well-rounded team and Sunday saw big performances from Maria Kazantsev, Camille Wilson, and Malia Smith. Apart from Stanford, they are the only team to have won all their games on Sunday and they will try to carry that momentum into Nationals. UCSD knew coming into Regionals that they were going to have a tough road ahead. While they had given USC a close game at Conferences, they took their offensive capabilities to the next level at Regionals and won the games that mattered on Sunday to secure the fourth bid to Nationals. In the second bid bracket game against UCLA, they suffered a discouraging loss but turned it around in their final game of the weekend and displayed an offensive prowess that drove them past a gritty USC team. UCSD is unafraid to have their deep receivers vie for floating hucks and against USC they came down with the majority of them. Their strategy across the weekend was to put the disc in the hands of specific players and patiently wait for an opening to score. UCSD may have also had the strongest sideline presence of all the teams at Regionals this year, and the energy visibly paid off against USC. The game was Psycho’s seventh game in the weekend, but their fortitude held strong, and big plays from Dena Elimelech, Leanne Go, and Kelli Iwamoto brought them to the first Nationals for all the team’s current players, and the program’s first appearance since 2007. All throughout their season, USC fought through tough games with tight margins for victories. In the end, that penchant for close games proved to be their undoing. In the final bid in the region, UCSD proved that they wanted it too much to give in to the pressure USC exerted. With their bid on the line, USC had unfortunate miscues close to the end zone. Too many times they worked it up right to the edge, only to rush a pass or miss a dump option. Their Conference title proved that they had all the tools needed to be in Cincinnati, but credit goes to UCSD for disrupting the talent and experience of USC’s offense. USC faced the most difficult journey of any team this weekend, playing eight games total which culminated in their fight for the fourth bid. The toll these games took was visible. In the final points against UCSD, the Hellions ramped up their intensity, but with the combination of wind, their deficit, and UCSD’s persistent handler resets, there was nothing that USC could do to take control. The missed bid is even more antagonising considering how close USC was in so many games: they lost no game at Regionals by a margin of more than two points. Comments on "Southwest D-I Regionals 2017: Tournament Recap (Women’s )"